Our favorite sale of the year is fast approaching!! Are you ready? We are! Over the next couple weeks we will be sharing what is on our "to-buy" list, so stay tuned. Nordstrom is our first go-to shopping destination and this sale doesn't disappoint. The Nordstrom Anniversary Sale is NEW Fall items at a discount. The selection and prices are fabulous! The Nordstrom Anniversary Sale runs from July 21 - August 6. If you want to ensure availability on your favorite brands, you can get EARLY ACCESS by signing up for a Nordstrom credit card by July 9. You'll also receive a $20 Nordstrom note that can be applied to your purchases. Not wanting another credit card? You can join the Nordstrom rewards program without signing up for the credit card and will receive a $10 Nordstrom note. Both these options get you early access that begins on July 13!! You can find all the details here. One of our best purchases from the sale last year, is this tunic. It's still available in 4 colors and on sale. 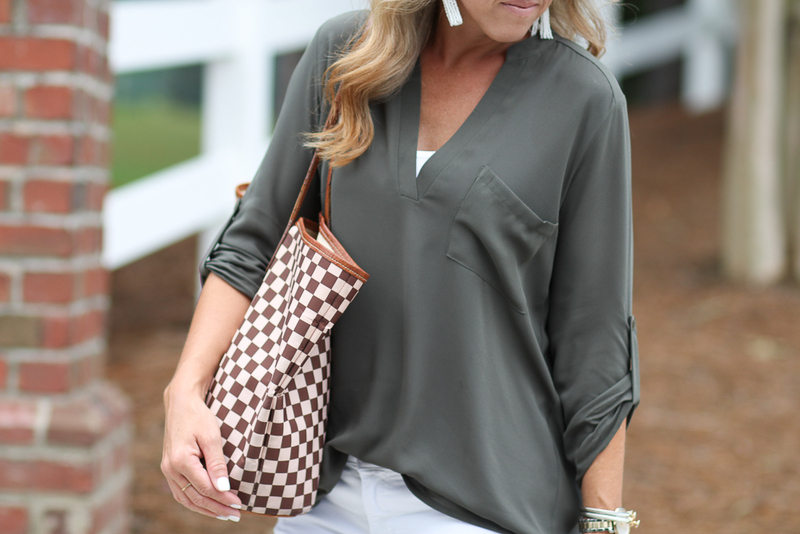 We both have this tunic in a couple colors. It looks cute with shorts, leggings, and jeans. Love how the olive shade works for every season!